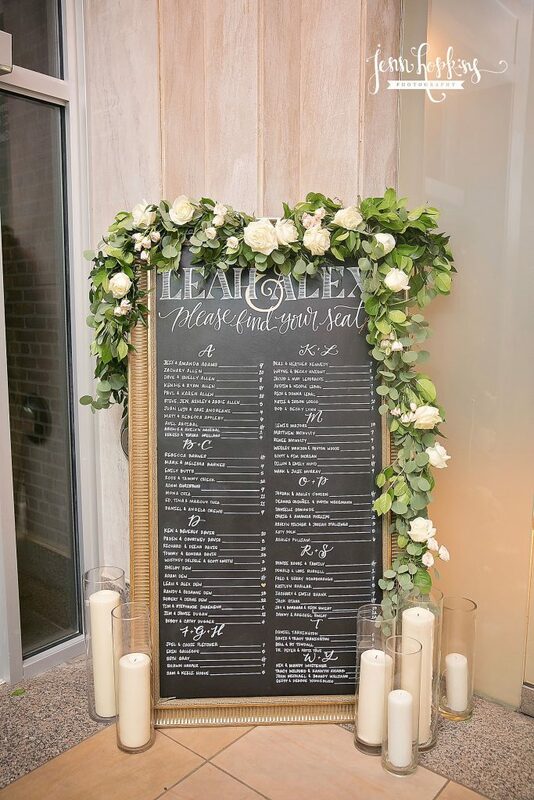 From the gold candleabras to the mixed garland around the seating chart, Leah and Alex’s wedding and reception were stunning. 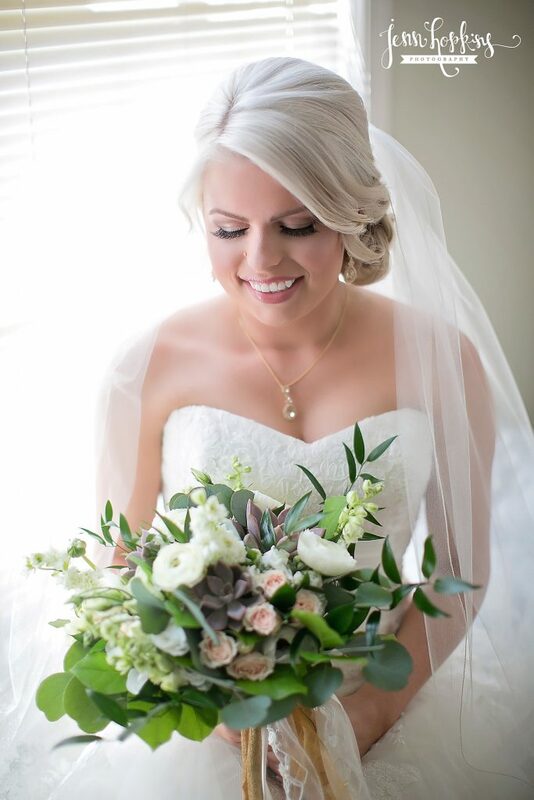 We loved working with Leah to create her floral vision on her special day. 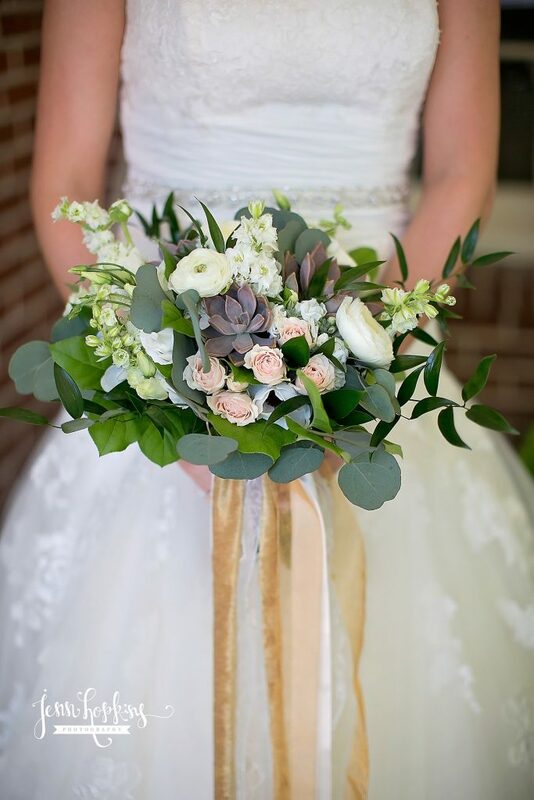 Leah carried a gorgeous natural bouquet created with spray roses, ranunculus, stock, anemones, larkspur, succulents and mixed foliage. 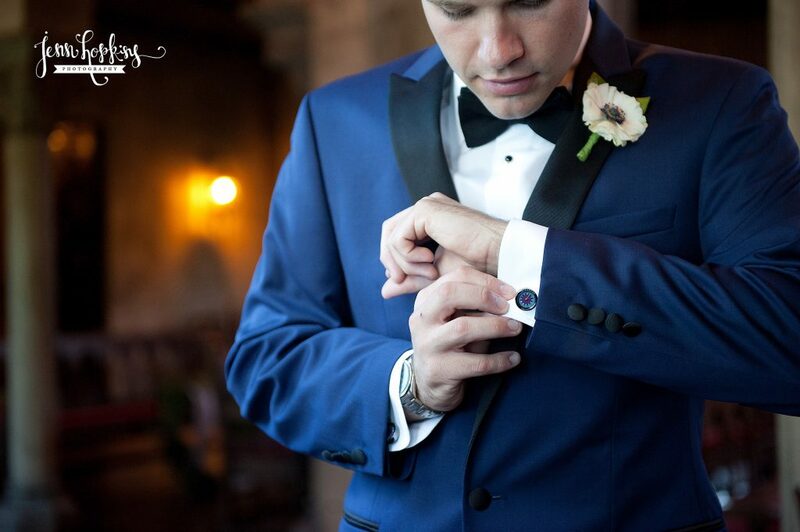 It was made using neutral colors. 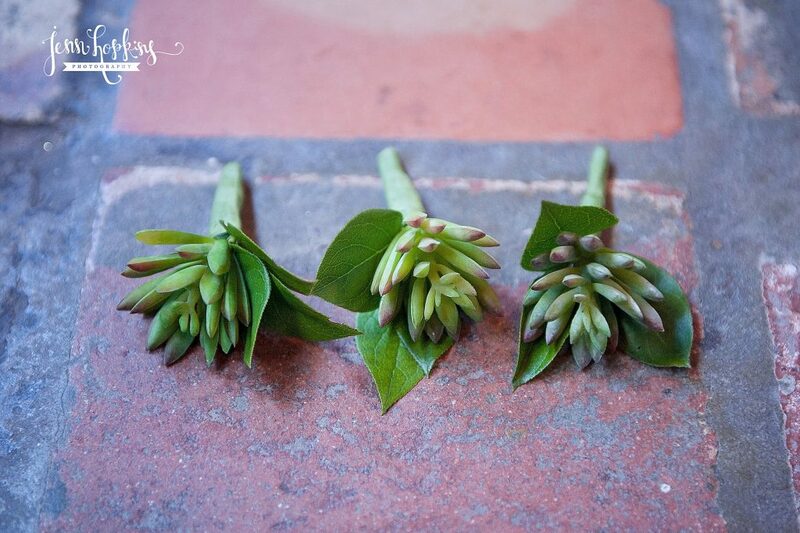 The girls bouquets were smaller versions of Leahs’ boquet. 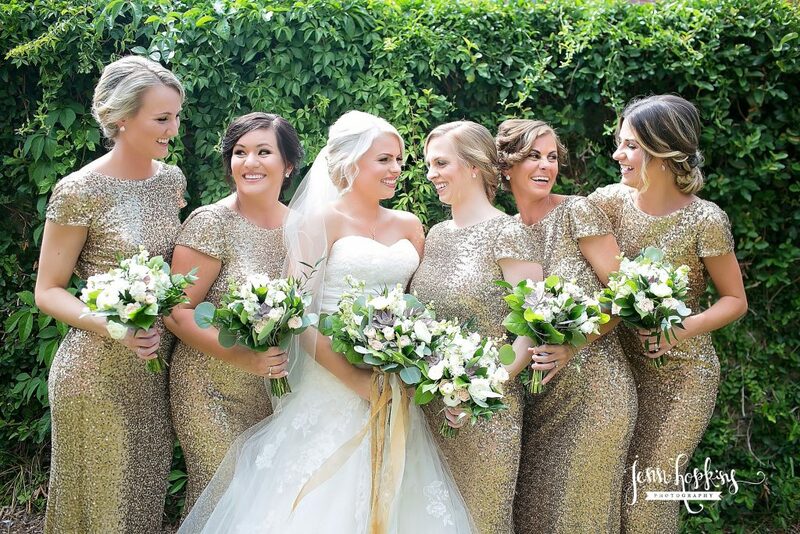 The looked absolutey gorgeous with the gold dresses the bridesmaids’ wore. 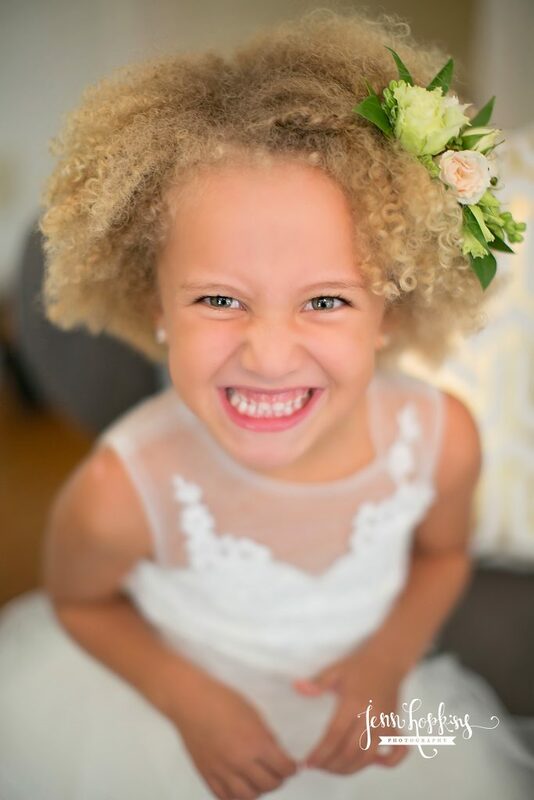 The flower girl wore a hair clip accented with flowers. 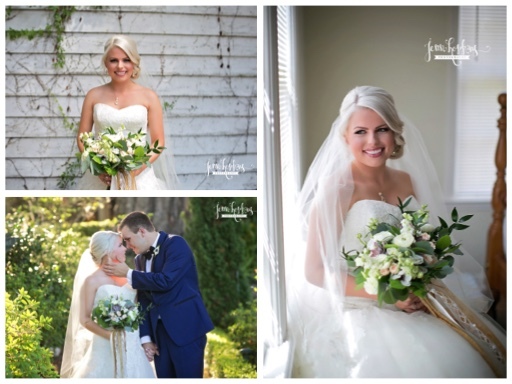 Alex wore a boutonniere created with a white anemone and greenery. 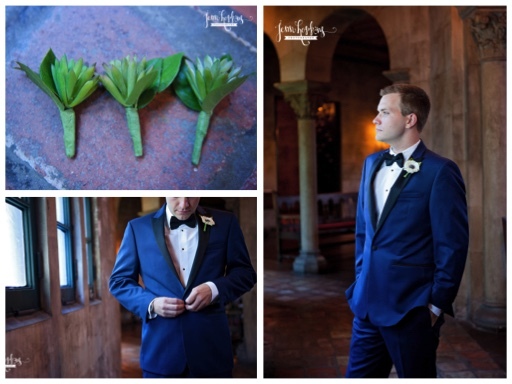 The groomsmen wore one that were succulents and greenery. 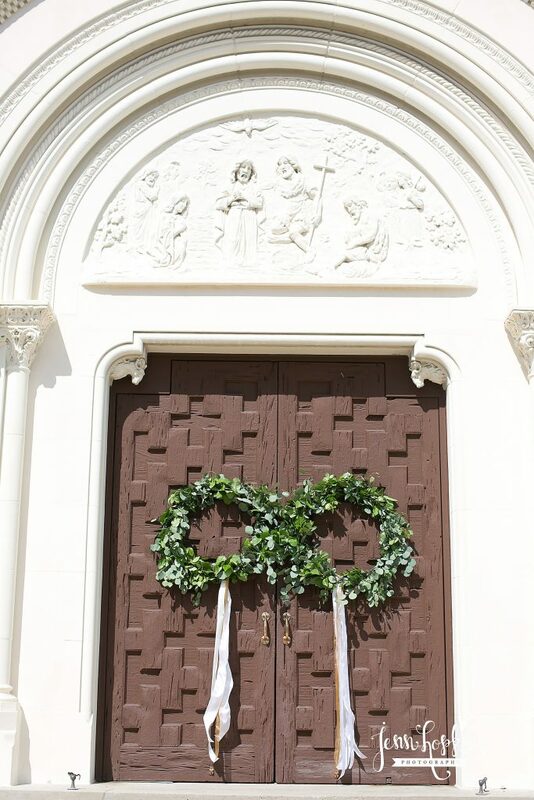 The front doors of Riverside Baptist had two wreaths of mixed foliage. 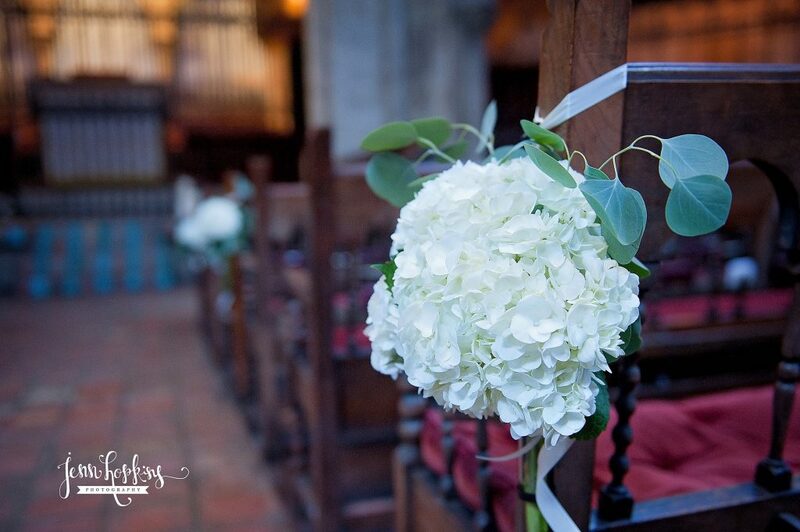 Inside every other aisle had a glass and wrought iron holder with white hydrangeas and cascading eucalyptus. 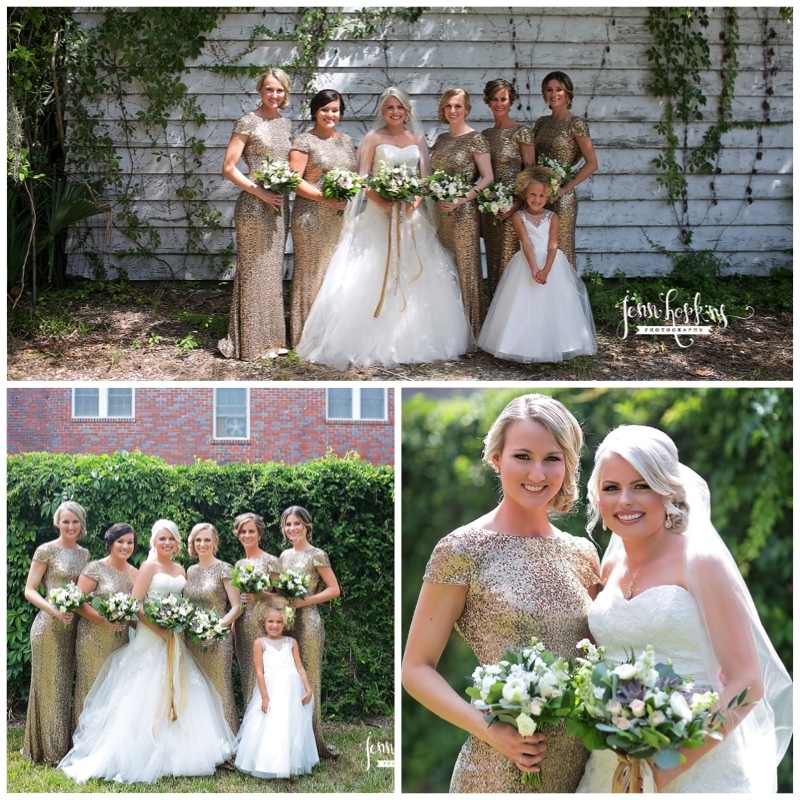 Leah and Alex had a beautiful reception of gold and navy blue. 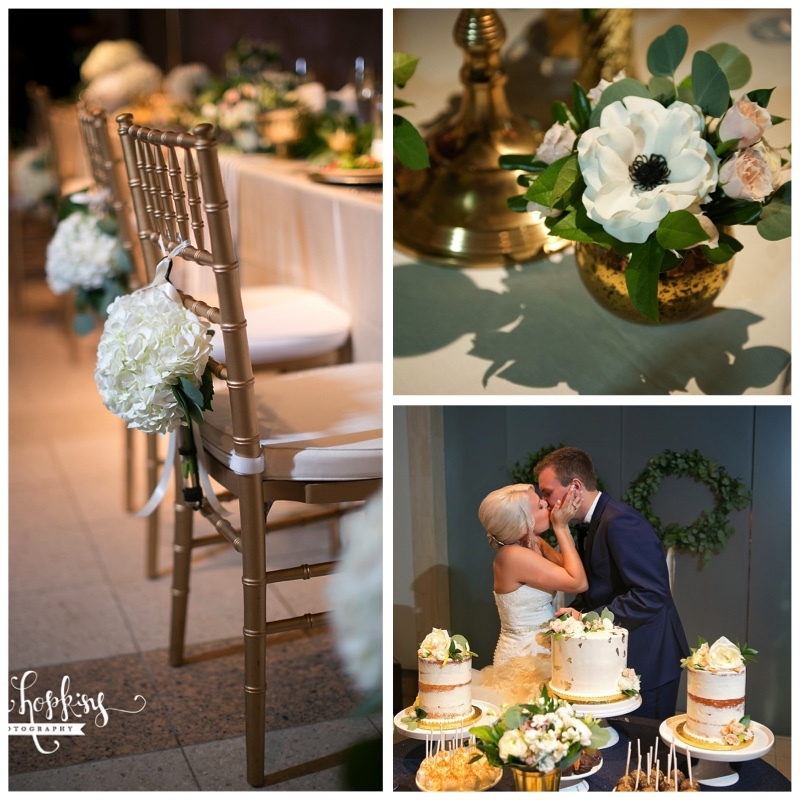 The head table had two gold candelabras, two low arrangements, four small gold urn arrangments, and a garland of mixed foliage. 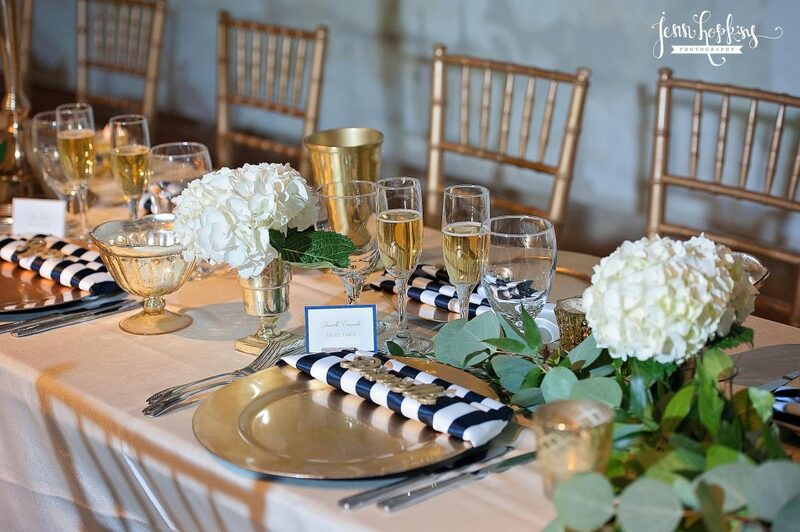 The guest table had a mix of low arrangments or gold candleabras. 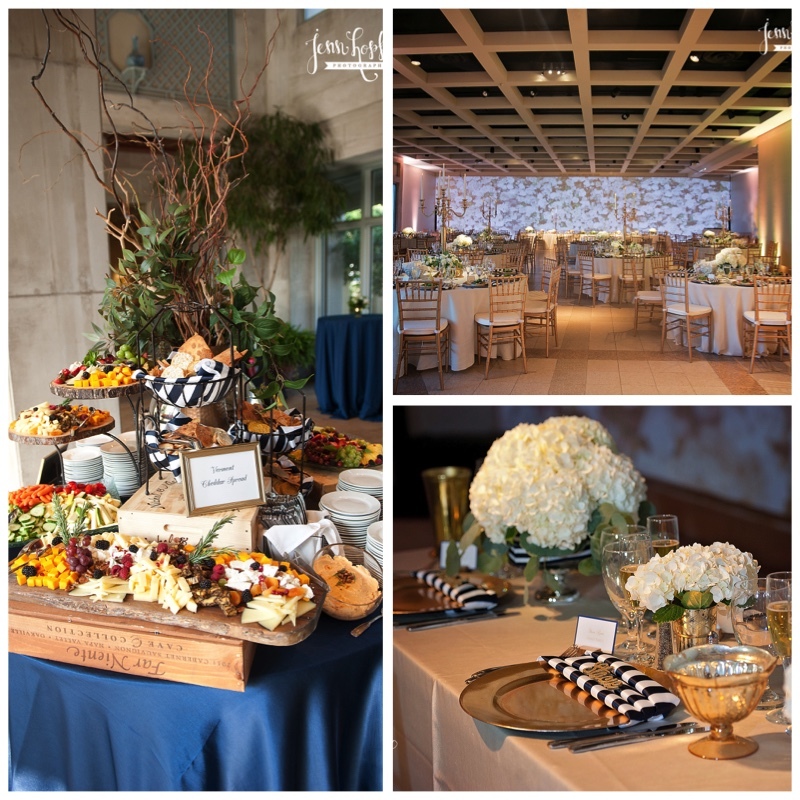 The low arrangments were created with white hydrangeas and touches of eucalyptus. 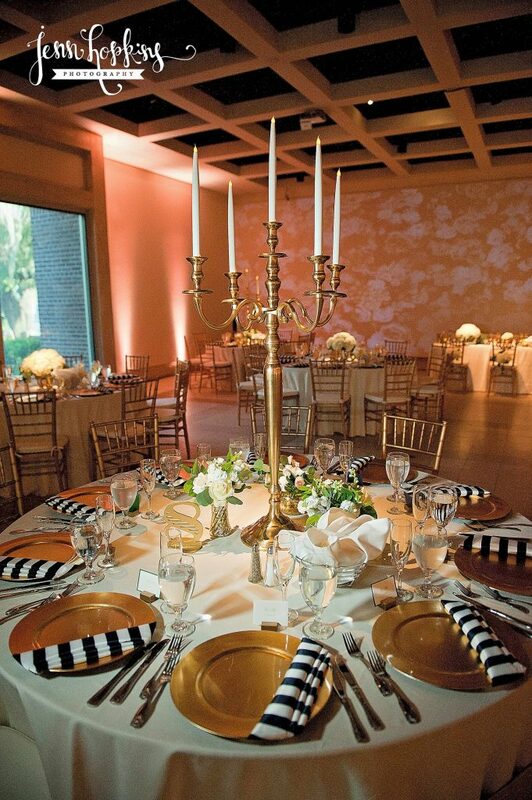 Gold eclectic votive candles were placed around the centerpieces. 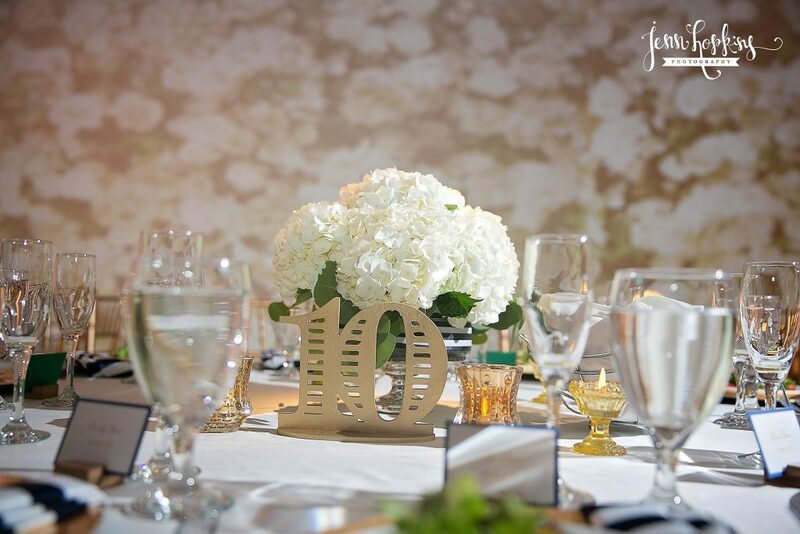 The gold candelabras had a mix of 3 small gold vases with arrangments of complementing flowers and an eclectic mix of gold votive candles. 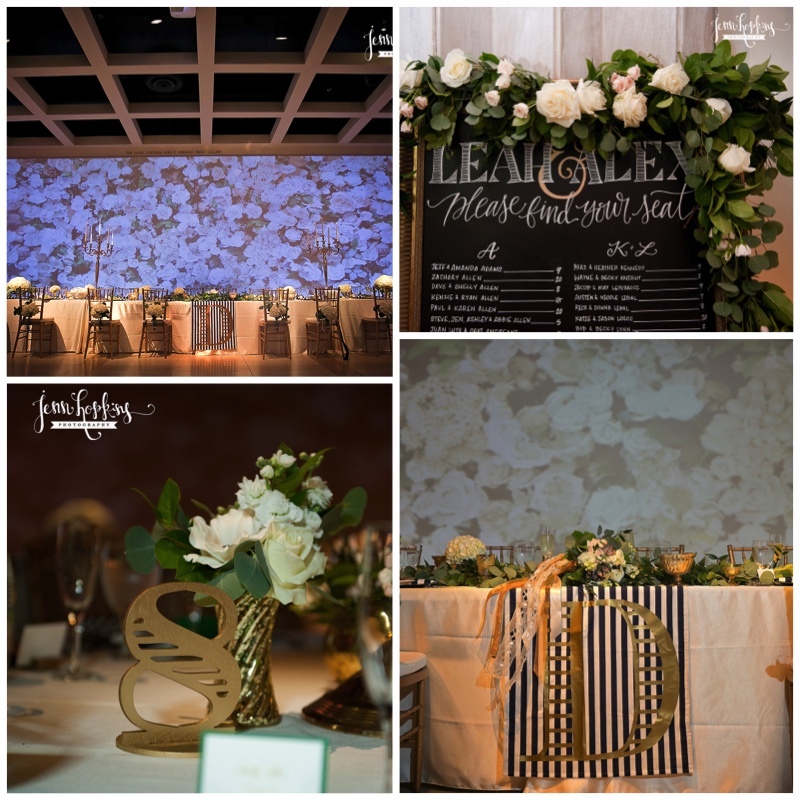 The seating chart a had a mixed green garland accented with ivory and porcellano flowers. 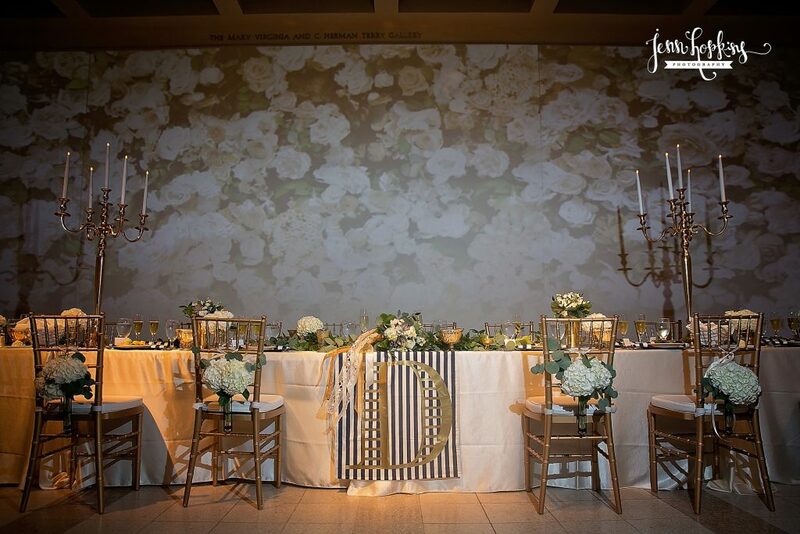 The cake table was decorated woth mixed greenery, ranunculus, spray roses, lisianthus, and roses.